Just Let Us Do Our Job! He crouched with the hot sun beating down on his back. In his hands he held a lump of rock. Examining it, he took note of its shape and the grain. Grasping another piece of rock he lifted his hand and struck the first with the second. A flake flew off. Picking it up he gazed at the result. No good. He struck again. No good. The process continued until he was happy with one flake. Turning it over in his weathered hands he then tucked it into a pouch with the other flakes he had made, and walked away into the bush. The archaeologist walked through the bush. His head was throbbing and the heat was stifling. The fly net covering his face buzzed with the flies that hung onto it. His toes were painfully hot in the steel toe-cap boots that were compulsory work-wear for the company. 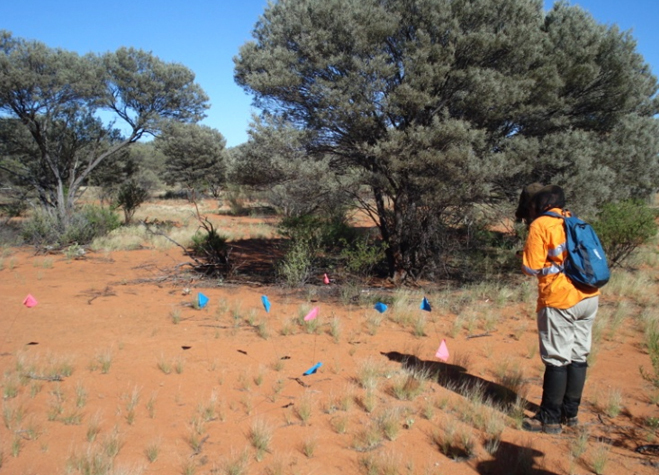 His calves were aching from the gaiters he had to wear to protect his legs from the pin-like points of the spinifex plants that covered the ground. Taking another mouthful of water from the hose leading from his Camelbak he paused and then crouched down. Laws stated that he was unable to pick up the stone flakes to check for the obvious signs that it was a deliberately made tool, struck by the traditional owners of the land. But he did. Yes. Platform, bulb of percussion, fissures marks. They were all present. Radioing to the other members of the team, spread across the bush, he informed them he had found a site. Gently placing the artefact back in the exact place he had lifted it, he methodically went though the surrounding stones chips around the area. Once satisfied that all pieces had been located, he marked them with flags and set about recording the GPS location and form filling that was compulsory on his NOMAD. Photographs were taken and they moved on. Continuing their walk through the unending heat, searching across the landscape for signs that humans had once walked where they were now walking, the archaeologists continued with their work, silently. Thirty thousand years could separate the two events described above. A traditional owner of the land, whose people had lived and worked with the Dreaming; man and nature co-existing for thousands of years with a respect for each other, before the white man came. Archaeologists are still not sure when man first reached Sahul, the prehistoric name for Australia. Placed at somewhere between thirty to fifty thousand years ago, it is believed that the first Indigenous peoples settled down the eastern coast before the west. Lake Mungo (1970) was a discovery of national importance as it showed that Australia had been settled long before originally thought. Archaeologists are still trying to piece together the prehistory of the continent, but it seems as though not everyone is interested in assisting them. The mining boom in Western Australia has bought wealth to the state and thousands of jobs, but at what cost to the tough job archaeologists have in mapping and assessing settlement and movement patterns across the continent? I know for a fact, as I have been one of them, that this wealth does not find its way to archaeologists even the wealth of information is not shared to assist in the understanding of the prehistory of the state. Mining companies are required to undertake Heritage Surveys on land they wish to mine, and archaeological consultancy companies are employed to do so. A report is written and sent to the bodies requesting the information – seems straight forward – but this does not appear to be the case. Talking to the office of the Minister for Mining, I was informed that the reports don’t get to the mining companies; they go to the land council who do not pass it on. Really? Hmmm, so it must get intercepted from when the archaeological consultancy companies send it to the mining companies – but by whom? Some information is passed on to the Department of Indigenous Affairs, (DIA) who work with the Aboriginal Heritage Act of 1972. Any person who has knowledge of the existence of anything in the nature of Aboriginal burial grounds, symbols or objects of sacred, ritual or ceremonial significance, cave or rock paintings or engravings, stone structures or arranged stones, carved trees, or of any other place or thing to which this Act applies or to which this Act might reasonably be suspected to apply shall report its existence to the Registrar, or to a police officer, unless he has reasonable cause to believe the existence of the thing or place in question to be already known to the Registrar. Therefore, by law, the archaeological companies are doing their job, but then things become cloudy. Upon asking how the mapping of Indigenous sites across the country was going, I was shocked to be informed that the reports archaeological companies prepare for the people who employ them, are not always correlated and interpreted. Some mining companies file away the reports and they are not shared. Contracts stipulate that the information gathered out in the field is confidential and not to used. There is nothing that can be done about these. This is, indeed, their right. But how does this serve in the understanding and interpretation of the first Australians? How can we interpret the findings so as to better understand issues like intensification; mid Holocene changes; areas of settlement and changes in settlement over time; demographic changes and the management and procurement of resources? Did colonization occur in waves or was it gradual? What were the migration patterns? And plotting the seasonal settlement patterns of the different groups? Artefact assemblages and technological change as well as how and why certain technologies became redundant? This is what archaeologists do, after all, unravel the mysteries of the human past. ‘Australian artefact assemblages changed during the Holocene and this principle is the key to understanding the nature and cause of that change’ (Hiscock 2006, p. 73). There are still huge gaps, and lots of debate, regarding the colonization of Australia and Western Australia is sadly lacking in the information required to answer questions as to whether the eastern states were settled first, as is commonly believed, or whether the west was colonized at the same time, but the evidence has just not been found yet – or it has, and sits in a filing cabinet somewhere. We need access to this information which could open up a whole new understanding to the settlement of not only Western Australia, but to understanding Australian settlement as a whole. Western Australia has Carpenter’s Gap (O’Connor 1995; Fifield et al, 2001) dating to c. 45,000 BP; Riwi (Balme 2000), dating to c. 40,500 BP; beads from Mandu Mandu Creek (Morse 1998, 1996, 1999) dating to c. 35,000 BP; Devil’s Lair cave dating to 48,000 years BP (Turney, et al. 2001); and Milly’s Cave c. 18,500 (Marwick 2002). The dates of these sites show the importance of trying to understand and map the settlement of the west especially in relation to the settlement of the continent as a whole. 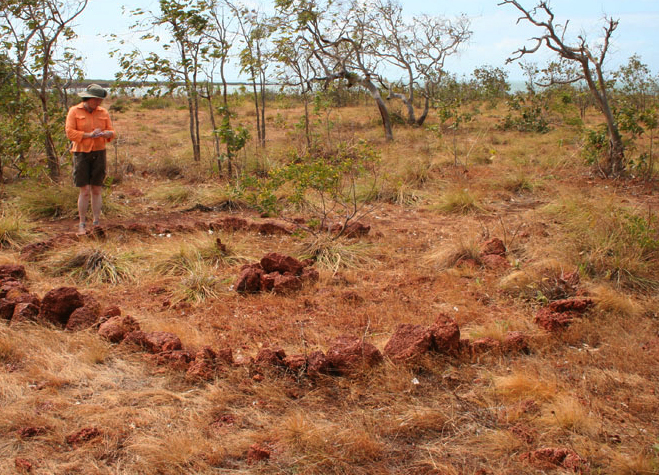 Field surveys, excavations and being in the ‘field’ is only a small portion of what archaeologists do. The majority of time is spent on research, interpreting, understanding and trying to date sites. Some portions of reports are available through the DIA, at no charge, but they need 24 hours notice before you come and also they need to know which reports you wish to view and the area they relate to. Ultimately lots of time, expense and patience, as well as somehow trying to track down names of reports, are needed in order to do your job. But this is one job that really needs to be undertaken. Frustrated at the lack of concern over letting archaeologists undertake their work to the fullest of their potential, working twelve hour days in the stifling heat, often walking up to, and beyond, 16 km a day, they deserve a medal. They are hard-core, true blue tough workers who are passionate about their job. Other stakeholders need to collaborate better so that all of the recorded information can be placed on a database, or at the least, have an easier way of accessing the information, for professionals (like archaeologists, stakeholders and other related professionals, for example, anthropologists) to better understand the settlement of this amazing country and let the Indigenous peoples know when their ancestors first walked through Sahul, the real First Australians. and any such prohibition extends to any object so nearly resembling the object to which the prohibition relates as to be likely to deceive or be capable of being mistaken for the same. Balme. J. 2000. Excavations Revealing 40,000 Years of Occupation at Mimbi Caves, South Central Kimberley, Western Australia. Australian Archaeology, Vol. 51. pp. 1-5. Department of Indigenous Affairs Aboriginal Heritage Act 1972. Government of Western Australia. Available from http://www.dia.wa.gov.au Accessed 29 June 2011. Fifield . I.K., Bird. M. I., Turney. C. S. M., Hausladen. P. A., Santos. G. M., and di Tilda. M. L. 2001. Radiocarbon Dating of the Human Occupation of Australia prior to 40 ka BP – Successes and Pitfalls. Radiocarbon. Vol. 43. pp. 1139-1145. Hiscock. P. 2006. Blunt and to the Point; Changing Technological Strategies in Holocene Australia. In I. Lilley (Ed). Archaeology of Oceania; Australia and the Pacific Islands. Oxford; Blackwell. Marwick 2002. Milly’s Cave: Evidence for Human Occupation of the Inland Pilbara During the Last Glacial Maximum. Tempus. Vol. 7. Pp. 21-33. Morse. K. 1988. Mandu Mandu Creek Rock Shelter. Pleistocene Human Coastal Occupation of North West Cape, Western Australia. Archaeology in Oceania. Vol. 23. pp. 81-88. Morse. K. 1996. Coastal Shell Middens, Cape Range Peninsula, Western Australia; An Appraisal of the Holocene Evidence. Tempus. Vol. 4. pp. 9-25. Morse. K. 1999. Coastwatch: Pleistocene Resource Use on the Cape Range Peninsula. In J. Hall and I. McNiven (eds) Australian Coastal Archaeology, pp. 73-78. Canberra. Australian National University. O’Connor. S. 1995. Carpenter’s Gap Rock Shelter 1: 40,000 years of Aboriginal Occupation in the Napier Ranges, Kimberley, WA. Australian Archaeology, Vol. 40. pp. 58-59. Turney. C. S. M., Bird. M. I., Fifield. I. K., Roberts. R. G., Smith. M., Dortch. C. E., Grün. R., Lawson, E., Ayliffe. L. K., Miller. G. H., Dortch. J., and Cresswell. R. G. 2001. Early Human Occupation at Devil’s Lair, Southwestern Australia, 50,000 Years Ago. Quaternary Research. Vol. 55. pp. 3-13.